Michael Kors is more than a mildly callous critic on Project Runway. He’s also a brilliant designer. With everything from ready–to–wear, everyday shoes, and handbags, Michael Kors knows good design. 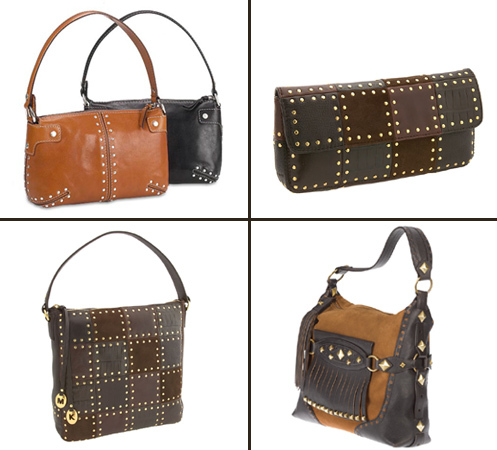 His Fall handbag collection is comprised of opulent arrays of brown and black leathers, with his trademark aligned studs. The “Astor” Hobo is an everyday classic. The new “Patchwork” Clutch and Hobo are glamorously rows of studded squares incorporated into multicolored leather. Finally, a Fall favorite is the “Kiltie” hobo, with its Scottish inspired combination of leather and suede, fringed trim, and brushed brass pyramid studs.